Ladies and gentlemen, prepare yourselves for the most twee place on earth. 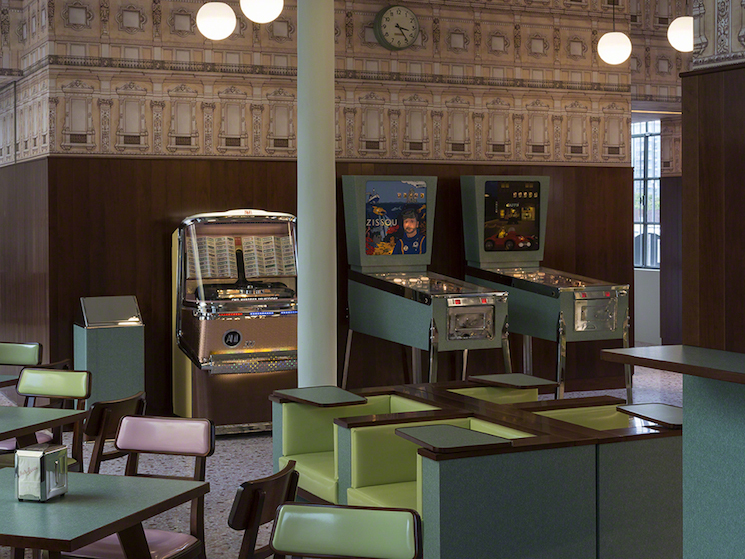 Painstakingly detail-oriented director Wes Anderson has opened his very own bar. You'll need to take a private jet from the 1970s or a hot air balloon or something else extremely whimsical, however, as it's located in Milan, Italy. As Wired reports, Anderson teamed up with Fondazione Prada to build a bar called Bar Luce in their new art and culture complex. The full complex is located in a distillery from the 1930s, and Anderson's bar is located within. As you'll see in the above photo, the spot looks exactly like a Wes Anderson movie, from the colour palette down to the attention to detail. And yes, Life Aquatic fans, that is a Steve Zissou-themed pinball machine. Speaking with Wired, Anderson said, "I think it would be an even better place to write a movie.... I tried to make it a bar I would want to spend my own non-fictional afternoons in." Bar Luce opens on May 9.